Gratitude is sometimes a forgotten attribute in the life of a Christian. Oh, most of us offer up joyful praise and thanksgiving when He comes through with a major blessing!!!!!!! 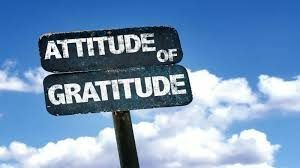 What I am talking about is an ongoing “attitude of gratitude”, which is a cornerstone in our relationship with God, as well as with others. This gratitude will invade every facet of our lives! We are to be thankful at all times for His presence, His provision, His mercy and for being called His Own. But what about when challenges come? It can be difficult to muster up genuine thanksgiving when those unexpected trials and testings arise. Our pastor has often told us that it is during these times that we are to REMEMBER – to look back on our lives and to see God’s faithfulness during our seasons of testing. I call this “the golden cord”. We look back at those dark times; yet in the middle of this darkness is the gleaming light of His care and mercy. Remember to remember! We are to thank Him even while reeling with shock in the midst of our suffering. Why? Because He will walk with us through it. Because His strength and His grace will sustain us. And because during this time, He will be conforming us to the image of His Son. Admittedly, this will be REALLY tough. And YET I would hope that my desire to obey my Lord would outweigh my heartbreak. May this be so for all of us who seek to be Your disciples, Lord Jesus.